Soak the bulgar in fresh, cold water for 10 minutes. Rinse in a fine hand-held sieve/strainer and press excess water with the back of a spoon. Combine the bulgar, lemon juice, and tomatoes in a bowl, toss lightly and let sit for 30 minutes to soften the grain. 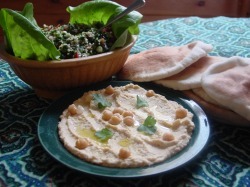 Mix with the rest of the ingredients and serve with pita bread, Arab flatbread, or scoop up with lettuce leaves. This Middle Eastern delight is refreshing and is a source of remarkable nutrition. Parsley, one of its main ingredients, contains several times the Vitamin C of citrus and is one of the higher sources of provitamin A, chlorophyll, calcium, sodium, magnesium, and iron. It promotes urination and works as a mild diuretic. Olive oil contains monounsaturated fat, a healthier type of fat that can lower your risk of heart disease by reducing the total and low-density lipoprotein (LDL, or "bad") cholesterol levels in your blood.